Symptoms of BLD include dark striping or banding on otherwise healthy-looking leaves; shriveled, discolored or deformed leaves; and reduced leaf and bud production. COLUMBUS – The Ohio Department of Natural Resources urges Ohioans to identify and report signs of beech leaf disease to minimize risk of disease spread. Beech leaf disease (BLD) is a newly observed disease affecting American and possibly non-native beech trees. BLD was first discovered in Lake County in 2012 and has quickly spread across northeastern Ohio. Infestations have been found in nine Ohio counties and parts of New York, Pennsylvania, and Ontario, Canada. Government and university scientists are currently working to learn more about BLD, but no causal agent has yet been identified for this disease. The ODNR Division of Forestry has received funding from the U.S. Forest Service to work with various partners within Ohio, other states and Canada to monitor the spread and document the impact of BLD to help inform research efforts and create management tools. Symptoms of BLD include dark striping or banding on otherwise healthy-looking leaves; shriveled, discolored or deformed leaves; and reduced leaf and bud production. Disease progression varies with tree size, but BLD appears to kill small trees within several years. No infected tree has ever been known to recover. BLD is not to be confused with beech blight aphids or eriophyid mites. Reports of BLD will be documented to inform future research and to monitor changes in forest composition and structure. 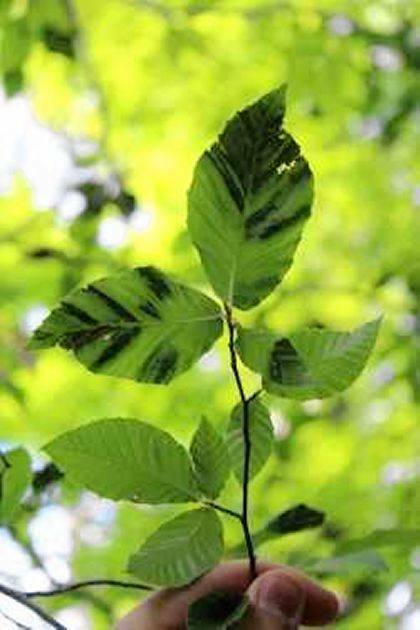 Landowners in northeast Ohio are encouraged to report any signs of BLD and report healthy beech trees. Additionally, landowners are urged to avoid moving beech trees or tree parts to prevent BLD from potentially spreading to new areas. To report BLD, contact ODNR Forest Health Program Administrator Tom Macy at thomas.macy@dnr.state.oh.us or use the BLD section of the NE Ohio Parks app available at parkapps.kent.edu.